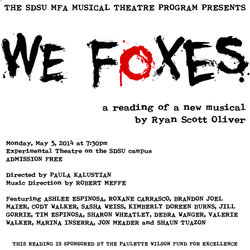 We Foxes at San Diego State University in collaboration with The Old Globe is completely free and open to anyone who is interested in the future of musical theatre. You must reserve a seat prior to the event. We Foxes is a Southern Gothic Musical Thriller written by Ryan Scott Oliver set in Missouri, 1945. It tells about Willa, a tough and unmannered orphan girl adopted by the Sheriff’s Wife, a calculating socialite, and the bloody domestic war that ensues between them when the girl uncovers the terrible secrets lurking beneath the floorboards. It is a story of intense human struggle, deliverance, and the great salvation found only through oneself. RYAN SCOTT OLIVER is a 2011 Lucille Lortel Award Nominee, a 2009 Jonathan Larson Grant recipient and wrote the music and lyrics for 35mm: A Musical Exhibition, Mrs. Sharp (2008 Richard Rodgers Award Winner, at Playwrights Horizons starring Jane Krakowski, dir. by Michael Greif), Darling (featured on the “Bound for Broadway” episode of NBC’s The Apprentice), the song cycle Out of My Head, Quit India (commissioned by UCLA), the music for Angus Oblong’s The Debbies, a commission for Disney Theatricals, The Frog Prince Continued (commissioned by Chicago’s Emerald City Theatre) and Jasper in Deadland (commissioned by the Pasadena Musical Theatre Program). Jasper in Deadland recently opened Off-Broadway to a rave review in The NY Times.